Lean at 1.88lbs. Mean, it packs heat. Titanium foil pan, Titanium pins and stiffeners, Aluminum Legs and Spars. Contact me via email to discuss availability (tomw at suspiciousdevices.com). ...is supported by a simple structure of 2 long "spars" and 2 foldable legs. 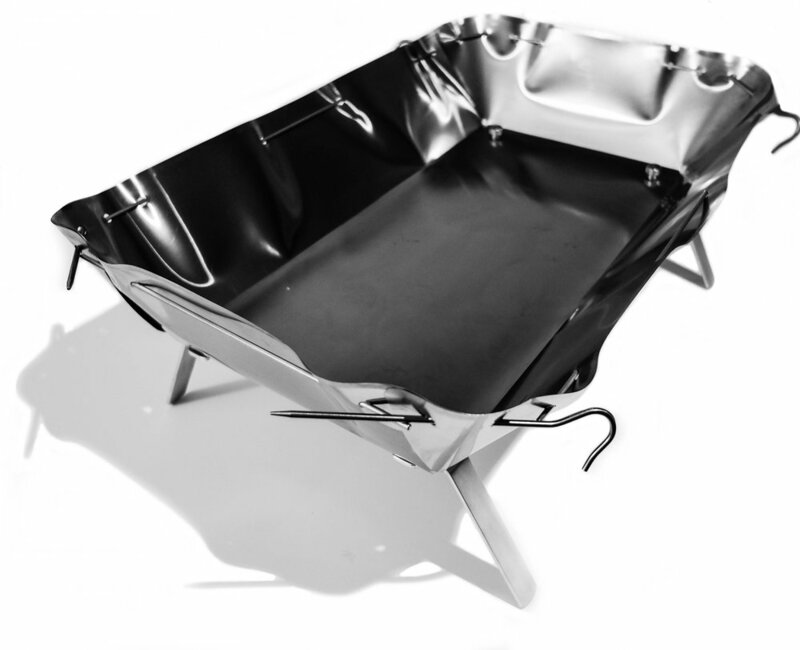 While the firepan can safely contain pounds of wood fuel, the structure allows the pan to flex to conform to uneven ground. Exposed Titanium foil would dice you and your gear like a fruit salad. Our innovative edge protection scheme prevents skin from contacting the sharp bits while still allowing the fire pan to roll compactly. ...securely hold the foil pan in its optimal shape. ...put the material in the correct orientation to support your wood fuel.